Alley Oops relates the painful and embarrassing aftermath of name-calling and bullying from the novel perspective of the bully. J.J. Jax has been tormenting an overweight boy named Patrick, calling him Pig-Pen and Porky, and now Patrick is afraid to go to school. When Mr. Jax finds out, he tells J.J. a story about when he was a bully, and how sorry he feels now. He explains about the two dogs inside us, one bad and one good, that fight all the time. “Which dog wins?” J.J. asks. “The one you feed the most,” Mr. Jax answers. Touched by his father’s words, J.J. bikes over to Patrick’s house to talk things over, and is surprised to discover how much he and Patrick have in common: they both think getting yelled at is better than being lectured, they both have little sisters who never get in trouble, and they both love the sport of arm-wrestling. Patrick even has an official arm-wrestling table. Patrick may be big, but he is also quite strong and an avid arm-wrestler. Trounced at the table, J.J. is impressed with Patrick’s “hammer hand” and decides to become his manager! The boys’ shared interest in arm-wrestling becomes the conduit for resolution and budding friendship. Bullying is a worldwide problem with negative lifelong consequences – for the bully as well as the victim. Nearly everyone knows a bully, has been bullied, or has bullied someone. 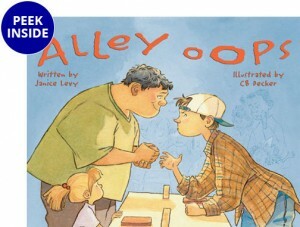 Alley Oops is a story about hurt and anger, empathy and hope, resilience and ingenuity. It’s about actions and consequences. And finally, it’s about that “alley oops!” moment when a child experiences the empowerment and self-esteem that come from doing the right thing. 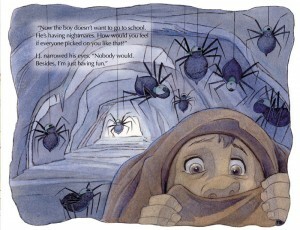 …The watercolor cartoons are lively and have contemporary details. …the book may be useful to help initiate discussion on this important topic. As I’ve said before, I just adore all the children’s picture books in FLASHLIGHT PRESS’s catalog. I’ve already reviewed several of them and my aim is to review as many as possible because these books are perfect for the children in your life aged 4 to 8. With that in mind, I checked their on-line catalog. I had a hard time choosing between Alley Oops and Carla’s Sandwich. I decided on Alley Oops because it’s a different kind of “bully” story and because my neighbor’s son has just had his first run-in with a bully–an age-old problem that has more repercussions than bullies realize until often too late. In this book Mr. Jax is surprised that his son J. J. has been bullying an overweight boy named Patrick, calling him bad names like Pig-Pen and Porky. When Patrick starts having nightmares, his father asks Mr. Jax to speak to J.J. The boy excuses himself, saying he was just having fun. How does Mr. Jax handle this situation? What does he tell his son to make him understand how bullying can really hurt a person, causing long-lasting problems, often ruining the other person’s life? Does J. J. listen to his father, then try to make amends to Patrick? If so, how does Patrick react? And what plan do they come up with that ends up influencing everyone at their school? As this author weaves her interesting, timely story, she deftly answers all those questions and more. This topic may seem a little above the children’s heads, but the book is so well-written and easy to follow that they should easily get the message. Furthermore, parents and educators can use this book to open discussion on this important topic and help the children further understand the impact of their words on others. 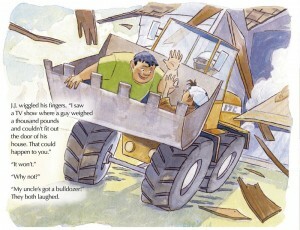 The message in this book can be used to build self-esteem and long-lasting friendships. 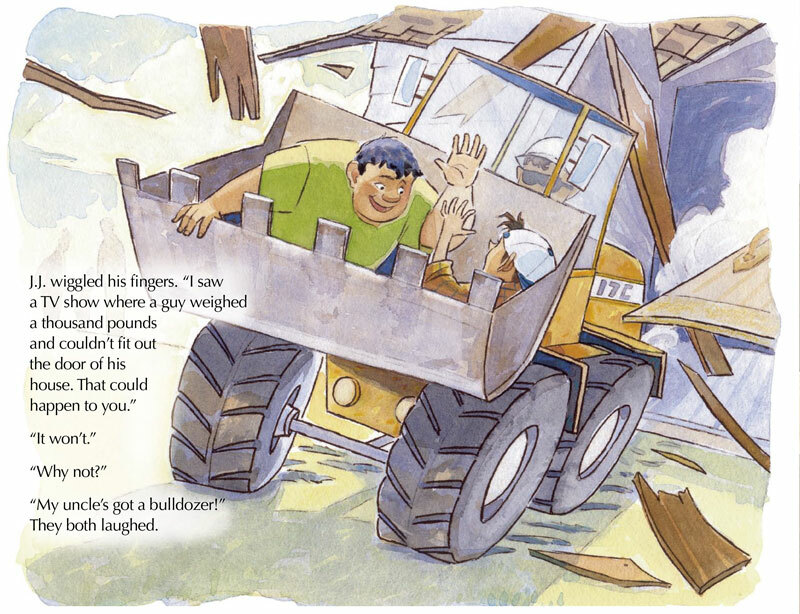 In addition to being educational, Alley Oops by gifted writer Janice Levy is entertaining and enhanced by colorful, meaningful illustrations by the talented artist Cynthia Decker. Giving guides help youngsters deal with emotional issues. Many of the most sought after children’s books are those that help youngsters deal with emotional issues. These new books tackle shyness, bullies, worries, baby sitters and tantrums. Parents, caregivers and teachers who need caring, empathetic guides to kids’ behaviors should consider these. Bullying is more dangerous than ever before. 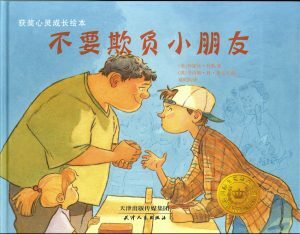 This lighthearted picture book tells of a father who’s discovered his son is calling an overweight boy names. Instead of yelling and criticizing, Dad relates a bully story from his own childhood, prompting young J.J. to think and react, eventually bonding with the other boy over arm wrestling and annoying-sister stories. One quote from J.J.’s dad is especially helpful – “Your grandpa used to say we have two dogs inside of us, one good and one bad, that fight all the time. The one that wins is the one you feed the most.” Alley Oops is important, and can help bullies understand the impact of their hurtful behavior. Bullies? Anyone have problems with bullying in your school? If you said, “no,” you are either lying to me or clueless. Bullying is the biggest problem kids talk about in school. They don’t obsess that they don’t have the designer clothes or mechanical pencils. They worry because someone is being mean to them or their friends and they don’t know how to respond. But what about the bully’s side of things? Have you considered helping bullies to transform and to empower themselves to stop? You will after reading Alley Oops by Janice Levy and illustrated by CB Decker. Be sure to read Janice’ interviews for insights into the deeper themes of Alley Oops. This title was released in 2005 and showed up on some of the bully lists I read, but I hadn’t held it in my hands until today. Could I plead having a limited budget as my only reason for not having this title? Not convinced? How about that I simply never saw this book or had access to it? Does that sound more realistic? Okay, I’m only human. I can’t read every single review out there and still play with the kittens. To make up for it, let me make sure you have this in your collection. I particularly enjoyed the illustrations where the much larger boys seems intimidated by the bully. Having four sons I appreciated the arm wrestling in this title. I can remember trying to arm wrestle my brothers. I was a little concerned at J.J.’s transformation as being too quick and less than perfect, but in her interview Janice Levy responds to this well. You’ll have to go read the interview yourself, I can’t tell you everything. I was able to see her point. Some people hold on to grudges their entire life. Is it because I am a girl that I can recite every time my ex-husband said something that hurt my feelings? Nah…When my sons are angry with each other, they settle things much more quickly and move on from it as friends. But, when it comes to bullying episodes, they remember every one they’ve experienced. Hopefully you will share this with students and families. I particularly like the humorous approach the author uses to communicate between the generations. You’ll recognize yourself there. Alley Oops was chosen as one of the Top 25 Character Education books by Character Education trainer of trainers Barbara Gruener, on The Character Education Partnership website. Character education is a nationwide movement encouraging schools to create environments that foster ethical, responsible, and caring young people. It is the intentional, proactive effort by schools, districts, and states to instill in their students important core, ethical values that all people share, such as caring, honesty, fairness, responsibility, and respect for self and others. The CEP is a national advocate and leader for this character education movement. Based in Washington, D.C., they are a nonprofit, nonpartisan, nonsectarian coalition of organizations and individuals committed to fostering effective character education in the nation’s K-12 schools. See http://www.character.org. Cleverly illustrated by CB Decker, this picture book tackles bullying, an age-old problem with devastatingly painful effects. Meet J.J. Jax, the bully in this story. Travel with him as he faces the consequences of his father finding out about his bullying behavior. See what his father has to say about his own brush with bullying. Get to know J.J.’s victim, Patrick, who no longer wants to go to school because of J.J.’s relentless taunting and teasing. Find out what happens when J.J. goes to Patrick to make amends. Can a bully and his victim find common ground solid enough to build a friendship? The author of this little gem delicately weaves in the parable of the two dogs inside each of us, representing the good and the bad, constantly at battle. When J.J. asks his father which one wins, he wisely responds, “the one you feed the most.” What a beautiful illustration of the power of choice. Check out this book; it will empower your children to wrestle with big choices and take a look at their own actions and reactions. 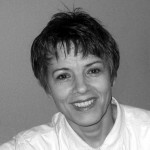 Barbara Gruener is a Counselor at Westwood Elementary in Friendswood, TX, and writer of a guidance webpage on academicplanet.com. JJ torments Patrick, who is overweight. Sticks & stones may break my bones, but names will never harm me. Yeah, right. Sure. Who made that one up? Alley Oops tells the story of the painful & humiliating aftermath of name-calling & bullying. JJ’s a skinny boy with a very sharp tongue & a nose for weakness, who’s dug his teeth into making Patrick’s days at school miserable by calling attention to Patrick’s size & calling him mean names. Now Patrick is a big boy, with a soft heart. JJ’s harassed him to the point he’s scared to go to school. When JJ’s dad hears of his son’s bullying, he first lectures him, which doesn’t impress JJ one bit. So Dad takes him aside & tells the story of when he was a kid… & a bully, & the consequences he only recently had to face because of what he’d done back then. Now JJ is impressed, so much so, he jumps on his bike & heads over to Patrick’s home to see if he can patch things up. There he discovers how much they have in common: little sisters who can do no wrong, & a passion for arm-wrestling …and JJ experiences the Alley Oops feeling of empowerment & self-esteem which comes from doing the right thing. With snappy dialogue & marvelous pictures focusing on the harmful & lasting effects of bullying, & the importance of finding common ground toward conflict resolution, Alley Oops is a teaching story that needs to be read, again & again. 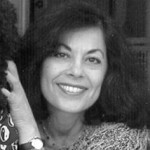 Janice Levy is the author of Alley Oops, illustrated by Cynthia Decker. A former ESL teacher, Janice has published many children’s books including The Man Who Lived in a Hat, Totally Uncool, Abuelito Eats With His Fingers, Abuelito Goes Home, The Spirit of Tio Fernando, Cinco de Mayo: Let’s Celebrate, and Remembering Abuelito. Her adult fiction has been widely published in anthologies and literary magazines, and she is a three-time winner of the Writer’s Digest Contest for Best Literary Short Story. Janice lives with her husband and two children in Merrick, New York. Read more about Janice’s work on her personal website. Cynthia Decker is the illustrator of Alley Oops by Janice Levy. Although she studied art at one college and two universities, Cynthia considers herself self-taught. Between universities, she worked in a large graphics studio for the LDS Church. Cynthia’s books include Celebrate the Fire Within, Everybody Makes Mistakes, My Father’s Arms, Avi the Ambulance to the Rescue, and Avi and the Snowy Day. She is the mother of four children, and lives in Eagle Mountain, Utah. You can see more of Cynthia’s work on her personal website. Error: Error validating access token: Session has expired on Sunday, 23-Sep-18 01:36:16 PDT. The current time is Friday, 26-Apr-19 01:03:56 PDT.